Berkery, Noyes & Co. represents Boucher Communications Inc. in its sale to Wolters Kluwer Health - Berkery, Noyes & Co., LLC. 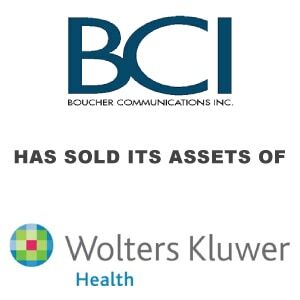 NEW YORK, September 9, 2005 — Wolters Kluwer Health today announced that it has acquired the total assets of Pennsylvania-based Boucher Communications Inc. (BCI). BCI assets will become a part of Wolters Kluwer Health’s Medical Research unit, a leading provider of print and electronic research information for medical and academic institutions, medical practitioners, and corporations. Terms of the agreement were not disclosed. Since its formation in 1997, BCI has focused exclusively on serving the optometry, opticianry, and ophthalmology markets. BCI’s five core vision care trade journals offer clinical and practice management information and business strategies. The award-winning titles include Eyecare Business, Optometric Management, Content Lens Spectrum and Ophthalmology Management, as well as Retinal Physician, a bi-monthly publication covering the latest scientific developments regarding advances in age-related macular degeneration (AMD), diabetic retinopathy, and posterior segment care. These publications have received numerous industry awards for editorial content, printing, and design. “We are extremely pleased to become part of Wolters Kluwer Health and are looking forward to exploring ways to provide more services to both our customers and subscribers,” said Pat Herron, President and Chief Operating Officer of Boucher Communications. “Our publications, related conference services and activities, and electronic initiatives will benefit from the strategic opportunities offered by many of the Wolters Kluwer Health Medical Research titles that will expand the depth of promotion and educational options for our customers.” In addition to the trade journals, BCI publishes a variety of specialty publications, including Framebuyer, a semi-annual supplement focused on eyewear fashion; New O.D., a quarterly magazine targeting optometry students and recent graduates; and a number of patient-directed and practitioner- focused supplements. BCI’s Health Care Conference Group owns and operates educational conferences and seminars for the vision care industry, including the internationally renowned Global Orthokeratology Symposium. BCI is also a leading provider of online newsletters, customized communication programs, and other electronic products in vision care. Wolters Kluwer Health (Philadelphia, PA) is a leading provider of information for professionals and students in medicine, nursing, allied health, pharmacy and the pharmaceutical industry. Major brands include traditional publishers of medical and drug reference tools and textbooks, such as Lippincott Williams & Wilkins and Facts & Comparisons; electronic information providers, such as Ovid Technologies, Medi-Span and SKOLAR; and pharmaceutical information provider Adis International. Wolters Kluwer is a leading multi-national publisher and information services company. The company’s core markets are spread across the health, corporate services, finance, tax, accounting, law, regulatory and education sectors. Wolters Kluwer has annual revenues (2004) of euro 3.3 billion, employs approximately 18,400 people worldwide and maintains operations across Europe, North America and Asia Pacific. Wolters Kluwer is headquartered in Amsterdam, the Netherlands. Its depository receipts of shares are quoted on the Euronext Amsterdam (WKL) and are included in the AEX and Euronext 100 indices. Comprised of Ovid Technologies ad Lippincott Williams & Wilkins (LWW) medical journals, the Medical Research (MR) business unit of Wolters Kluwer Health is a leader in the development, production, and delivery of print and electronic research information for medical and academic institutions, medical practitioners, and corporations. As the primary online source for all Wolters Kluwer Health content, Ovid offers hundreds of electronic databases and books and more than 1,200 journals, including full text in science, technology, and the humanities. LWW publishes more than 275 journals and newsletter products, including some of the industry’s most respected titles, in specialty fields for physicians and clinicians, and distributes them through customized society portal pages and through electronic distribution to Ovid’s 13 million users worldwide. Berkery, Noyes specializes in investment banking for the information, publishing, tradeshow and communications industries. Among the 15 transactions completed by Berkery, Noyes as of Sept. 8 of this year are the acquisition by The Wicks Group of DesignWrite, Inc., the acquisition by Veronis Suhler Stevenson of Facts On File, the acquisition by ProQuest Company of Voyager Expanded Learning, the acquisition by Bank Administration Institute of Bankers Training and Consulting Company(BTCC), the acquisition of Delta Education LLC by School Specialty, Inc., the sale of the assets of Medquest Communications to VendomeGroup LLC and Bankers Systems acquisition of PCi. Berkery, Noyes’ clients range from private companies seeking a buyer, to most of the major international information companies who use the firm’s expertise in locating, analyzing and negotiating with acquisition candidates and in managing divestitures. The firm operates with a staff of twenty-six professionals serving the information and publishing industry from offices in New York.